Today marks the release of some exciting new information about the Spanish Theatre of the War of Spanish Succession. 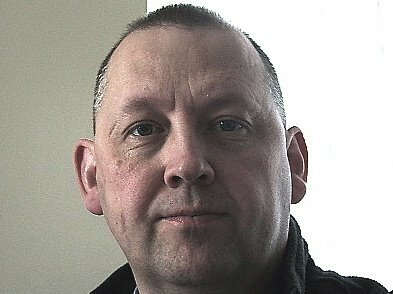 There is a great deal of information in the English language about the northern (Marlburian) theatre of the war . . . but a great deal less about the two southern theatres (Italy and Spain). 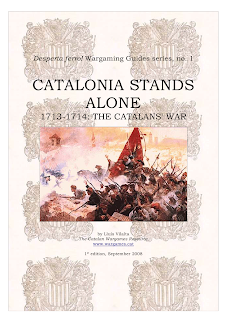 Today that has changed as a group called "The Catalan Wargames Resource" has released its first publication, "Catalonia Stands Alone: 1713-1714: The Catalans' War" in .pdf format. Best of all it is Free! Click on the above title to get to the download page of this 44-page .pdf file. It not only has maps and information about battles, but also has information and illustrations of uniforms and flags for quite a number of units. I haven't had a chance to read it yet (it is in English by the way), but I've done a quick scan and I can already see that there is a lot of information that I will use. 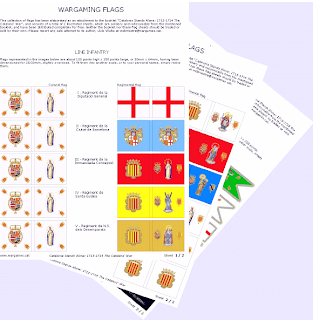 The image at the top of the article is of the "cover" of the booklet; and the second (to the left) is of the three pages of flags to print and use that are also included in the download. While I believe it is in the Catalan language, they do have links to translations into a number of other languages (click on your appropriate flag). Let us all salute this group of gamer/historians who have added a wonderful resource for our hobby. Aha - great minds, Jeff, think alike! Thanks for the heads up Jeff. It is certainly a welcome addition to my library. Thnaks for bringing this to our attention. There's enough flags for an imagi-nation army. A rare and precious find - thanks for sharing! Will you (ab)use the peculiar flexibility / elasticity of the 'EvE' world to integrate this campaign in 'our 'Urope? Despite not having any WSS plans, I've spent a chunk of time absorbed with the contents of this. It's an excellent work. Well done to them.